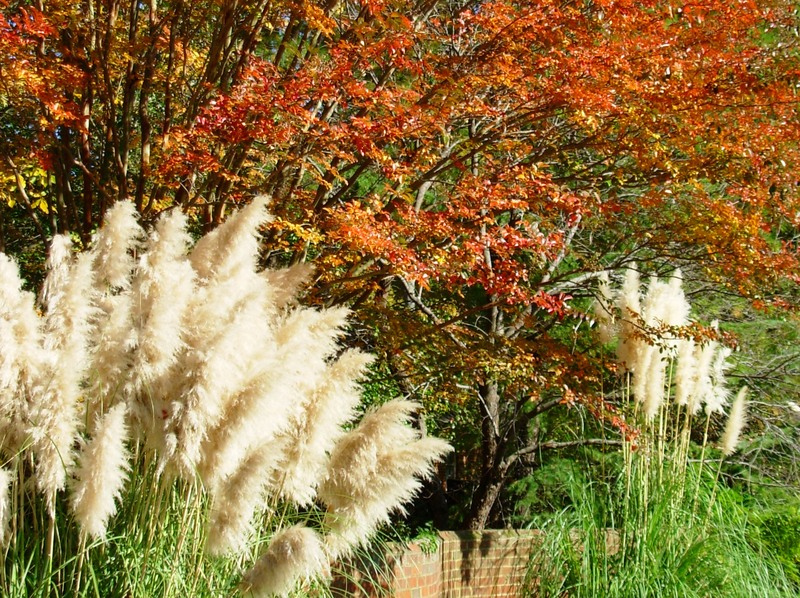 Feathery grasses and fiery foliage: get ready for the autumn show. Just when we were wondering whether our relief at the cool weather was greater than our disappointment at how fast the summer flew by, the brilliance of October arrives to remind us that the passage of time is a magnificent spectacle. Our years are a long-running pageant of laughter, trouble, love, sorrow, joy, sighs and grief. How appropriate that the waning of the year brings such a combination of emotions, sights, scents and sounds. Nature provides a vivid demonstration of the gifts inherent in approaching death, as even the dried grasses, fallen leaves and faded flowers enrich the soil of new growth in the spring. Nothing can stopper time, but its sweet fruits are preserved, etched into memories that we will savor through the cold months ahead. Light a candle, put the kettle on and rejoice in the wealth of being right where you are, right now. Yes, and autumn seems to say that better than any other season, with many holidays and much festive fun ahead. When the sun is shining and it’s cool and colorful outdoors, with leaves turning and some flowers still in bloom, it’s a wonderful combination of the best of each season. Thank you Alan! I’m so happy you like it. Thanks, Merry. I’ve always loved the way Pampas Grass looks in the sunlight. Almost better than a flower. Yes, we’ll be hunkering down soon, but memories of yesterday’s warm slanted light will help keep me glowing for a bit longer! Susan, you sound as if you are the exact kind of golfer I would be if I ever took up the game…lost ball, camera, sunset walks. 😀 Sounds like the ideal sport. Now if I could only find some way to do all that cheaply frugally!